Vision Hospitality Group, Inc. has opened the 88-room Hampton by Hilton located in East Ridge. The hotel is part of the 50-acre Jordan Crossing development that will include over 300,000 square feet of retail, restaurants and hotels all at the entrance to one of the largest sports recreation parks in the State of Tennessee, Camp Jordan Park. Hampton by Hilton was designed with both today’s business and leisure traveler in mind. Located at 623 Camp Jordan Pkwy., the hotel is accessible from both I-24, and I-75, and includes an outdoor pool with enhanced features and a state-of-the-art fitness facility and business center. The property and its amenities are complimented by its convenient location near Camp Jordan Park, which caters to families and travelers participating in sports tournaments and special events. The hotel also meets the needs of corporate travelers who are looking for a convenient stay with complimentary amenities close to the area’s numerous businesses. This location also provides easy access for guests traveling to and from the Atlanta area looking for an alternative to a downtown Chattanooga accommodation. The company’s partnership with Hilton continues to expand as Vision plans to open five additional Hilton-branded hotels by the end of 2019. Team members exhibit a unique culture described as Hamptonality. This term is defined by each hotel’s approach to friendly customer service, anticipation of guests’ needs, and establishing an authentic, caring culture, said officials. 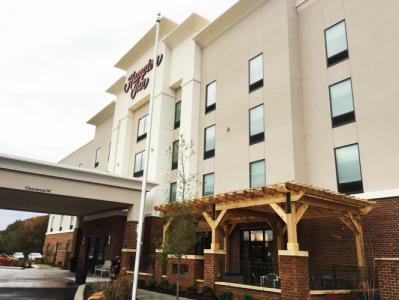 Hampton Inn by Hilton Chattanooga East Ridge is part of Hilton Honors, the award-winning guest loyalty program for Hilton’s 14 distinct hotel brands. Hilton Honors members who book directly through preferred Hilton channels save time and money, and gain access to benefits such as an exclusive member discount, free Wi-Fi and a flexible payment slider that allows members to choose nearly any combination of points and money to book a stay. Members can also redeem their points for free nights, to gain access to unique events through the Hilton Honors auction platform or to make purchases at Amazon.com with Amazon Shop with Points. For more information or to make reservations, please visit Hampton Inn by Hilton Chattanooga/East Ridge or call 269 6600.